Around 200 Cuban dissidents are holding a public meeting in Havana in defiance of a ban on political opposition. The dissidents say the two-day meeting is "a triumph" and have been played a video message of support from US President George W Bush. Cuban authorities did not intervene but had earlier expelled several European politicians who planned to attend. Also on Friday, 200,000 supporters of President Fidel Castro heard him deliver a speech on US-Cuban relations. The dissident meeting, organised by the Assembly for the Promotion of Civil Society in Cuba, is hoping to promote democracy in the Communist state. Taking place in a garden outside one of the organisers' homes, it began with a rendition of the national anthem and shouts of "liberty". Event organiser Martha Beatriz Roque, said it was the first open opposition meeting in 46 years of Communist rule. "This is a triumph for all the opposition," she said. 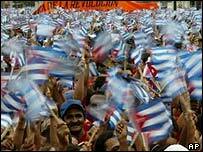 The delegates began by calling for the release of all political prisoners in Cuba. 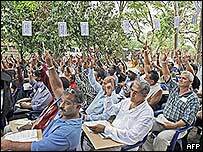 President Bush praised the activists for coming out of the "shadow of repression" in the video message played to the meeting from a laptop computer owned by US diplomat in Cuba James Cason. "We will not rest. We will keep the pressure on until the Cuban people enjoy the same freedom in Havana that they have in America," Mr Bush said. Not all dissidents have backed the meeting, however. Oswaldo Paya, of the Christian Liberation Movement, accused Ms Roque of working with the Cuban security forces. He also said that her backing by hardline exile groups in Miami could be used as an excuse for a future crackdown by Cuban authorities. Although Mr Cason attended on Friday, Cuban authorities acted to prevent other foreigners reaching the venue. Czech Senator Karel Schwarzenberg and German MP Arnold Vaatz had been seized by police and driven to Havana airport on Thursday. The European Commission described the expulsions as unacceptable. Two Polish MEPs were refused entry to Cuba earlier in the week. And at least two journalists, from Poland and Italy, were detained by the Cuban authorities ahead of the meeting. In Havana on Friday, thousands of Castro supporters gathered in a show of support and to hear the president's evening speech, in which he focused on relations with the US. He said Cuba had shared extensive intelligence on terrorism with US President Bill Clinton in the late 1990s, some of it carried in messages by Colombian writer Gabriel Garcia Marquez.